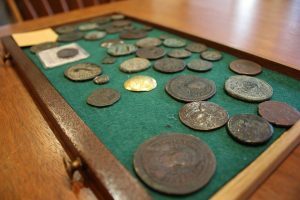 Rediscovery and Restoration of a 279-Year-Old Treasure The Benjamin Borden Grant, the original grant for the land on which W&L now sits, turns 279 this month. It has been conserved and is stored in W&L's Special Collections. For 90 years, the original grant for the land that Washington and Lee now sits on has resided in Washington and Lee’s Special Collections vault. The grant, a vellum document issued by George II on November 6, 1739, deeded more than 92,000 acres of land by the British Crown to Benjamin Borden. Issued by William Gooch of the colony of Virginia, it was formalized seven years before the birth of George Washington and 10 years before the founding of what is now known as Washington and Lee University. The grant of land included all of Lexington and a sizable section of Rockbridge County. 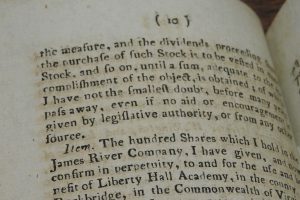 The original grant from George the Second, King of Great Britain, France and Ireland, dated sixth day of November 1739 covers all the land on which the City of Lexington Virginia and all of its public buildings and institutions of learning are located. This original instrument has followed the vicissitudes, the ups and downs, the rise and fall of the fate and fortunes of my family for nearly two hundred years. Its future preservation will be more secure in the keeping of some permanent institution than in private hands, and believing it should abide henceforth amid the innumerable titles it has mothered; I, John Bowyer of the City of Abilene in Taylor County, Texas do hereby give and grant and commit to the keep and custody of the Washington and Lee University of the City of Lexington in Rockbridge County, Virginia, said original grant which is hereto attached. The Benjamin Borden Grant is the original grant for the land that Washington and Lee now sits on. 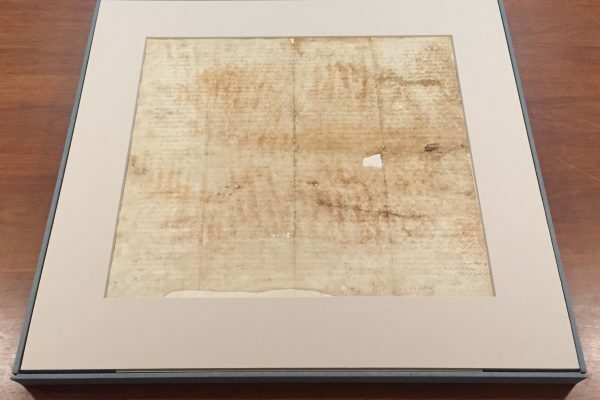 Through the generosity of the late Edward Franklin Romig II, another Benjamin Borden descendent, the very fragile vellum document was restored and rehoused in spring 2015. 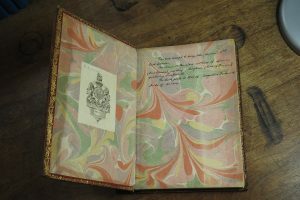 Etherington Conservation Services, an internationally recognized book and paper conservation lab in Greensboro, North Carolina, undertook the process. Earlier conservation work was undertaken in 1940 by the National Archives, where the document was lined with paper rather than skin due to the pre-war scarcity of such material. Although clearly compromised physically, and distinctly less legible than when it was penned more than 275 years ago, the document has not diminished in importance. In early 2015, conservators surface-cleaned and stabilized the piece by “floating” it in a storage mat, which allows the skin to expand and contract as needed. Additionally, conservators designed and constructed an elegant, grey/blue linen box to house the item in its storage mat. A custom-fit cover, also in grey/blue linen, ensures that light and dust will not reach the priceless document. 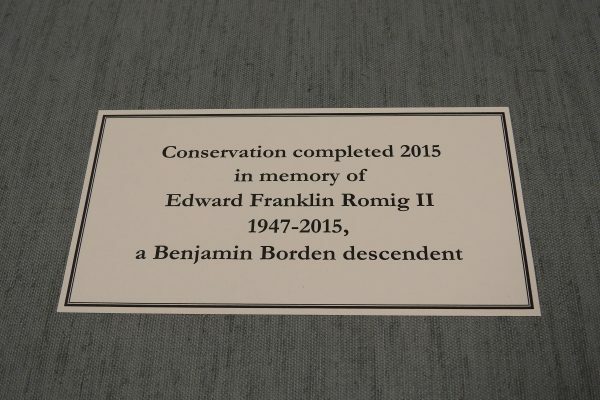 Thanks to the thoughtfulness of John Bowyer, descended from a long line of Washington and Lee supporters and alumni, and the generosity of Frank Romig, a Benjamin Borden descendent, the original grant, nearly 300 years old, is safe and secure in the Special Collections vault and will remain so for generations to come.